This "Historically Speaking" column was published in the Exeter News-Letter on Friday, November 23, 2018. Wouldn’t it be nice to give Dad a warm flannel shirt? In the nineteenth century, this would mean Mother, or maybe one of his daughters, would have to make the shirt. Exeter’s Robinson Female Seminary had three years of sewing classes included in the domestic science department, which included basting, overcasting, running stitching, hemming, felling overhanding, patching and darning. It was possible to purchase clothing made by a tailor or seamstress, but it would be expensive for something as ordinary as a shirt. The first stop, after measuring Dad and making a pattern, would be the local dry goods store. In the United States, a dry goods store specialized in textiles and clothing production. This was the place you would shop to find the fabric needed for home sewing projects. Women produced the undergarments, linens, kitchen toweling and most of the clothing the household needed. Some items, like heavy outerwear or ‘Sunday best’ suits and dresses, might be made by a tailor, but otherwise, Mother and daughters were expected to have the skills to keep up with the family’s needs. Like cooking, sewing was undervalued by those who were not expected to do it and it could be either a tedious chore or an outlet for artistic expression. Many times, when we think of a dry goods store, images of a country general store pop into our mind. This might be because in many parts of the country, particularly rural areas, the general store had to sell a wide variety of goods. Dry goods were simply one part of the store. But in a town like Exeter, which had a bustling commercial area, dry goods were sold separately. In the 1872 town directory, there are three dry goods establishments on Water Street – Thomas Conner, Joseph Gale and Stephen Piper. In the growing west end of town (out by the railroad depot) G.C. 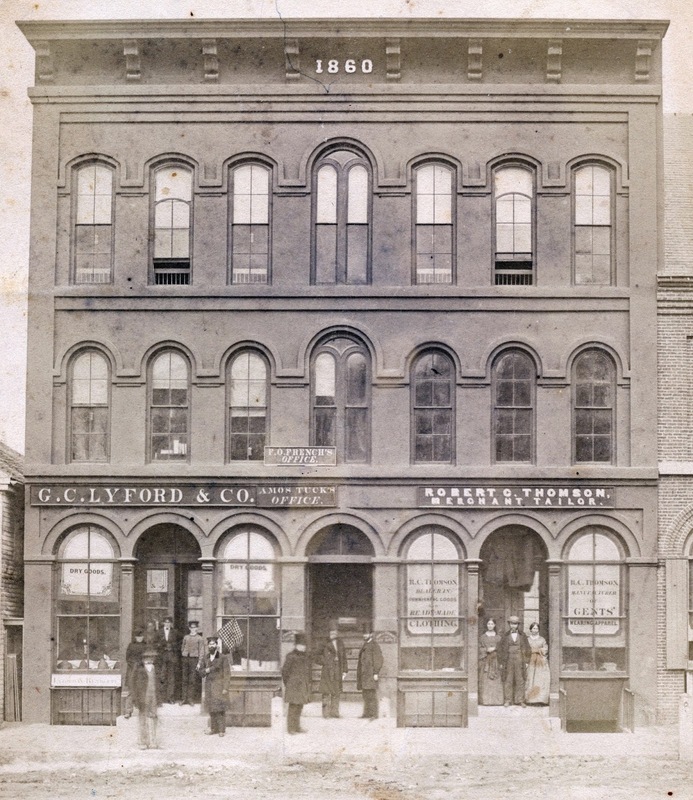 Lyford had a dry goods store on the corner of Washington Street. His advertisement in June of 1873 included “Black alpacas, mohairs & brilliantines, black cashmeres, black poplins, linen shirt bosoms, bedticking, shirting stripes and cashmere shawls” – all the types of fabrics you’d want to wear in the summer, right? If you were the family seamstress, you would need to be familiar with a dizzying array of textiles. “Amoskeag brown and blue drillings, cottonades and double twist cassimeres, cotton & wool check shirtings, Kentucky jeans, doeskins, colored cambric and silesias,” ran the advertisement. Most of us today are lucky if we can name even three types of fabric – and most likely one of them is felt. Lyford’s ad also tells us that the dry goods store in 1873 was already producing some ready-made goods. Shawls, table coverings and both cotton and linen napkins were for sale, although most women simply made these themselves. He also boasted about his “usual assortment of remnant goods.” Remnants were the bits and pieces of fabric found at the end of a bolt or the rejects from the factory. These might have an errant weave in the pattern or were of a size that was too small for any useable garment. Remnants were handy for making handkerchiefs, napkins or pocket linings. Thrifty families could produce children’s clothing from remnants, so it was wise of Lyford to advertise that he kept these in stock. B. Baer, who sold dry goods in Newmarket, also sold blankets and ‘buffalo skirts,’ which wasn’t a skirt at all but a heavy fur lap blanket backed in wool or cotton to be used in an open sleigh. Joseph Gale included “small wares, hosiery, &, &” in his advertisement. Thomas Conner gave up the dry goods business after a fire destroyed his shop in 1873. After that, he went into banking. Lyford’s shop on the corner of Front and Washington streets was eventually owned by Ivan Purington, who allowed his daughter, Winifred, to work there as a clerk. As a graduate of the Robinson Female Seminary (class of 1885), Winifred knew her sewing well. She renamed the shop “The Little Corner Store” and bought out her father’s interest, tidied up the grounds and ran it until her death at the youthful age of 49. “Miss Purinton was a woman of marked business ability and of many fine qualities” her obituary noted. It was a bit unusual to have a woman serve as proprietor of a business – unless it was a millinery shop, which specialized in hats. The dry goods stores began rebranding themselves after the Depression of the 1930s. Ready-made clothes became the standard for most families as prices dropped and department and catalog stores became the preferred way to obtain clothes. Today, the closest you’ll come the old dry goods store is perhaps a fabric and crafts shop. Image: G.C. Lyford’s Dry Goods store inhabits the same building on Water Street as Robert Thomson’s Tailor Shop. Dry Goods stores catered to the home seamstress, supplying fabrics, notions and some “fancy goods.” This photo was taken before 1872, when Lyford moved his shop to the corner of Front and Washington streets.